Romy Grace is Legal Counsel at the Impact Investment Group (IIG). She completed the inaugural Jewish Care Victoria Yesod Program in 2016. 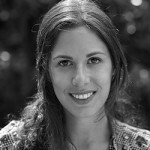 Romy Grace, Monday, 12th December 2016 - Romy Grace is one of 10 young professionals to recently complete Jewish Care Victoria’s inaugural Board Foundations program, Yesod. In this article, she talks about what she learned about the responsibilities of not-for-profit board directors and why boards need to look to the next generation.